Obeah (sometimes spelled Obi, Obea, or Obia), is a term used in the West Indies to refer to folk magic, sorcery, and religious practices developed among West African slaves, specifically of Igbo origin. Obeah is similar to other Afro-American religions including Palo, Vodou, Santería, and Hoodoo. Obeah is practiced in Suriname, Cuba, Jamaica, Trinidad and Tobago, Dominica, Guyana, Barbados, Grenada, Belize, The Bahamas, and other Caribbean nations. During slavery, Obeah was directed against the European slave masters. However, with the rise of Christianity, Obeah is considered a taboo, and the term has pejorative associations. In parts of the Caribbean where Obeah existed, slaves were taken from a variety of African nations with differing spiritual practices and religions. It is from these arrivals and their spiritualisms that Obeah originates. The theory of origin that is most accepted and is supported by the W. E. B. Du Bois Institute database traces obeah to the dibia or obia (Igbo: doctoring) traditions of the Igbo people. Specialists in Obia (also spelled Obea) were known as Ndi Obia (Igbo: Obia people) and practised the same activities as the obeah men and women of the Caribbean like predicting the future and manufacturing charms. Among the Igbo there were oracles known as ọbiạ which were said to be able to talk. Parts of the Caribbean where Obeah was most active imported a large number of its slaves from the Igbo dominated Bight of Biafra. In another theory, the Efik language is the root of obeah where the word obeah comes from the Efik ubio meaning 'a bad omen'. The last theory of the origin of Obeah lies with the Ashanti who called their priests Obayifoɔ and their practices Ɔbayi (pronounced "oh-beh-ah-yee", the word was an anglicized distortion like many other Akan words, e.g., "bɛsɛ" becoming "bissy", thus the pronunciation of "obeah") (Akan: witchcraft). There is also evidence of Akan names among Obeah men of the Caribbean in the 17th and 18th centuries. The Akan origin of Obeah has been criticised by several writers who hold that an Igbo origin is more likely. However, in colonies where Bight of Biafra slaves were less represented and Akan were plenty (Suriname and Guyana), Obeah is thought to be more of a mixture of Akan and European Christian beliefs. Obeah came to mean any physical object, such as a talisman or charm, that was used for evil magical purposes. Obeah incorporated various beliefs from the religions of later migrants to the colonies where it was present. Obeah also influenced other religions in the Caribbean, e.g. Christianity which incorporated some Obeah beliefs. In 'The Serpent Myth', William Wynn Westcott, one of the founders of the 19th century Golden Dawn magical order, claims "Ob was an Egyptian word for serpent' and is the source of the term 'Obeah'. Obeah figure confiscated form a black man named Alexander Ellis on his arrest in suspicion of practicing as an 'obeah-man' in Morant Bay, Jamaica in 1887. The term 'obeah' is first found in documents from the early 18th century, as in its connection to Nanny of the Maroons, but discussion of it becomes more frequent when it was made illegal in Jamaica after Tacky's War, in which an obeahman provided advice to the rebels. In 1787 a letter to an English newspaper referred to "Obiu-women" interpreting the wishes of the dead at the funeral of a murdered slave in Jamaica: a footnote explained the term as meaning "Wise-women". 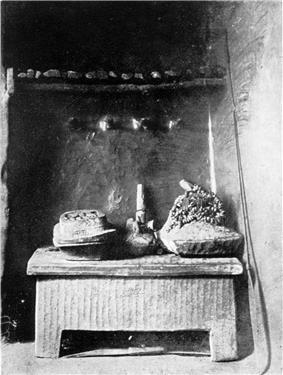 A continuing source of white anxiety related to Obeah was the belief that practitioners were skilled in using poisons, as mentioned in Matthew Lewis's Journal of a West India Proprietor. An anti-Obeah law passed in Barbados in 1818 specifically forbade the possession of "any poison, or any noxious or destructive substance". A doctor who examined the medicine chest of an Obeah man arrested in Jamaica in 1866 identified white arsenic as one of the powders in it, but could not identify the others. The unnamed correspondent reporting this affirmed "The Jamaica herbal is an extensive one, and comprises some highly poisonous juices, of which the Obeah men have a perfect knowledge." During the mid 19th century the appearance of a comet in the sky became the focal point of an outbreak of religious fanatical millennialism among the Myal men of Jamaica. Spiritualism was at that time sweeping the English-speaking nations as well, and it readily appealed to those in the Afro-Caribbean diaspora, as spirit contact, especially with the dead, is an essential part of many African religions. During the conflict between Myal and Obeah, the Myal men positioned themselves as the "good" opponents to "evil" Obeah. They claimed that Obeah men stole people's shadows, and they set themselves up as the helpers of those who wished to have their shadows restored. Myal men contacted spirits in order to expose the evil works they ascribed to the Obeah men, and led public parades which resulted in crowd-hysteria that engendered violent antagonism against Obeah men. The public "discovery" of buried Obeah charms, presumed to be of evil intent, led on more than one occasion to violence against the rival Obeah men. Laws were passed that limited both Obeah and Myal traditions but due to the outrages perpetrated by the mobs of Myalists, the British government of Jamaica sent many Myal men to prison, and this, along with the failure of their millennialist prophecies. One aspect of Obeah that is familiar to Trinidad and Tobago, though not all other nations where Obeah is practiced, is the Moko-Jumbie, or stilt dancer. Moko was a common word for Ibibio slaves. In the Trinidad and Tobago Obeah tradition. A Douen is a child who has died before being baptized, and is said to be forced to forever walk the earth at night in English-speaking regions of the Caribbean. Jewelry is made from deadly toxic red and black seeds called jumbies, jumbie eyes or jumbie beads (seeds of Abrus precatorius containing the lethal AB toxin abrin) in the Caribbean and South America. By contrast, the moko-jumbie of Trinidad and Tobago is brightly colored, dances in the daylight, and is very much alive. The moko-jumbie also represents the flip side of spiritual darkness, as stilt-dancing is most popular around holy days and Carnival. 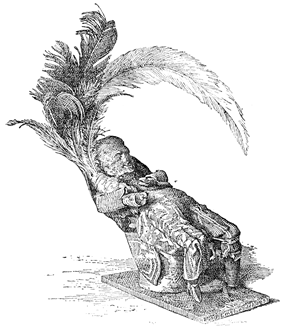 Although 18th-century literature mentions Obeah often, one of the earliest references to Obeah in fiction can be found in 1800, in William Earle's novel Obi; or, The History of Three-Finger'd Jack, a narrative inspired by true events that was also reinterpreted in several dramatic versions on the London stage in 1800 and following. One of the next major books about Obeah was Hamel, the Obeah Man (1827). Several early plantation novels also include Obeah plots. In Marryat's novel Poor Jack (1840) a rich young plantation-owner ridicules superstitions held by English sailors but himself believes in Obeah. Aleister Crowley, a controversial English mystic declared the 'Book of the Law' was dictated to him in 1904 by a non-physical being. Ch 1 verse 37 reads: "Also the mantras and spells; the obeah and the wanga; the work of the wand and the work of the sword; these shall he learn and teach"
Zora Neale Hurston researched and wrote widely on the subject, including essays, drama, and the novel Jonah's Gourd Vine. The former slave, Christophine, in Jean Rhys's novel Wide Sargasso Sea is a practitioner of Obeah. Solitaire, the female lead in the James Bond novel Live and Let Die (novel), is said to have "the power of the Obeah." An Obeah woman is a sort of matchmaker in Earl Lovelace's novel Salt. Ma Kilman in Derek Walcott's epic poem "Omeros" is a healer who uses Obeah. In the novels and memoirs of Jamaica Kincaid there are several passages that mention Obeah. A central character in Unburnable is reputed to be an Obeah woman. The protagonist of the novel Brown Girl in the Ring by Nalo Hopkinson is an Obeah-woman in training, learning from her grandmother. She uses her abilities to defeat an evil Obeah-man and his duppy. Obeah is heavily referenced in Douglas Preston and Lincoln Child's novel Cemetery Dance. A main character in the 2009 YA novel Three Witches by Paula Jolin (Roaring Brook/MacMillan)is a native of Trinidad and attempts to use Obeah to raise a dead classmate. Several characters in the book "The Book of Night Women" by Marlon James are said to practice Obeah, and it is a focal point at a number of points in the novel. Shadowcatcher, the antagonist in the Nicholas Da Silva graphic novel series Dread & Alive (novel), is an Obeah-man who uses Obeah to regain the prized amulet taken away from him by his brother, Cudjoe, the Myalman of the Jamaican Maroons." Robert louis Stevenson Jamieson and his Brother Arthur Conan Doyle Jamieson are both Practicing Obeah in the Necroscope: the lost Years Novel from Brian Lumley. In the films Pirates of the Caribbean: Dead Man's Chest and its sequel, Pirates of the Caribbean: At World's End, the character of Tia Dalma is called an "Obeah woman" and has (among other skills) the power to restore life. In the action thriller Marked for Death, obeah plays a major role in the plot. Captain Beefheart composed and recorded a song called "Obeah Man" in 1966, but it went unreleased until included in the 1999 box set "Grow Fins: Rarities 1965–1982". He also used the phrase "obi-man" in the song "Golden Birdies" on his album Clear Spot. The famous Grenadian-Trinidadian calypsonian The Mighty Sparrow sings a song entitled "Obeah Wedding". Bahamian singer Exuma recorded the song "Obeah Man", which was included on his eponymous debut album in 1970. African American singer, pianist and civil rights activist Nina Simone took on the role of "Obeah Woman" in the song of the same name which she performed live on It Is Finished (1974). She used this image of a powerful African witch, who "could hug the sun, kiss the moon and eat thunder" to manifest her rage concerning the situation of African-Americans at the time. The film Meet Joe Black features a Jamaican woman who calls the title character an "obeah man" (translated as "evil spirit") until she has learned that he is in fact a personification of Death. A chutney music duo Babla & Kanchan sang a song entitled "Obeah". Obeah is a Salubri clan discipline in White Wolf Publishing's Role-playing game Vampire: The Masquerade. Obeah is the religion listed on a computer screen of a 13-year-old girl, Alisa Beldon, identified as a latent telepath in the Babylon 5 episode "Legacies" (Season 1, Episode 17). In the television series version of Da Kink in My Hair hairstylist Starr chants to give herself strength which suspiciously sound like spells to some of the Caribbean clients of the West Indian hair salon. When styling church-going Sister Corrine the woman exclaims "Don't bother bring dat obia business to me...get this vodou witchcraft woman 'way from me head!" illustrating the contrasts between acceptance and disdain for obeah in the Caribbean. In episode 2 of the 1974–1975 television series Kolchak: The Night Stalker, entitled "Zombie", a grandmother, identified as "Mamalois" (the feminine version of "papaloi", an Obeah priest), seeks revenge for her grandson's death by turning him into a zombie to do her bidding. Obeah plays a major role in the 2001 horror movie "Ritual". In Live and Let Die, James Bond's love interest, Solitaire, played by Jane Seymour, is said to have the power of the Obeah. A subplot in a Barney Miller episode entitled 'Computer Crime' (season 5, episode 22) features an Obeah woman (played by Mabel King). ^ Generally conceived as an adjective, it is frequently used as a noun, yet Obe or Obi is the noun substantive. Williams J, Voodoos and Obeahs: Phases of West Indian Witchcraft, (1932) Lincoln MacVeagh, Chapter:1 Origin of Obeah. The word obeah may be the feminine adjective of the substantive obi, which signifies a charm. Deane J, The Worship of the Serpent (1883) p.163. ^ a b Eltis, David; Richardson, David (1997). Routes to slavery: direction, ethnicity, and mortality in the transatlantic slave trade. Routledge. p. 88. ^ a b Incayawar, Mario; Wintrob, Ronald; Bouchard, Lise; Bartocci, Goffredo (2009). Psychiatrists and Traditional Healers: Unwitting Partners in Global Mental Health. John Wiley and Sons. p. 222. ^ a b c Rucker, Walter C. (2006). The river flows on: Black resistance, culture, and identity formation in early America. LSU Press. p. 40. ^ Eltis, David; Richardson, David (1997). Routes to slavery: direction, ethnicity, and mortality in the transatlantic slave trade. Routledge. p. 74. ^ Chambers, Douglas B. (2009). Murder at Montpelier: Igbo Africans in Virginia. Univ. Press of Mississippi. pp. 14, 36. ^ Thomas, M.; Desch-Obi, J. (2008). Fighting for honor: the history of African martial art traditions in the Atlantic world. Univ of South Carolina Press. p. 58. ^ McCall, John Christensen (2000). Dancing histories: heuristic ethnography with the Ohafia Igbo. University of Michigan Press. p. 148. ^ Metcalf, Allan A. (1999). The world in so many words: a country-by-country tour of words that have shaped our language. Houghton Mifflin Harcourt. p. 78. ^ Chambers, Douglas B. (2009). Murder at Montpelier: Igbo Africans in Virginia. Univ. Press of Mississippi. p. 263. ^ a b Konadu, Kwasi (2010). The Akan Diaspora in the Americas. Oxford University Press US. p. 140. ^ Delbourgo, James. "Gardens of life and death". bottom: British Society for the History of Science. p. 3. Retrieved 07-06-2010. ^ Folklore IV. Folklore Society of Great Britain. 1893. pp. 211–212. ^ BECARA, i. e. White Man. "To the Editor of the Universal Register." Times [London, England] 23 Nov. 1787: 1. The Times Digital Archive. Web. 7 June 2012. ^ "Colonial Intelligence." Times [London, England] 5 Dec. 1818: 2. The Times Digital Archive. Web. 7 June 2012. ^ "The Obeah men are hired to revenge some man's wrong, while Myal men profess to undo the work of Obeah men and to cure those subject to Obeah alarms." OUR SPECIAL CORRESPONDENT. "The Outbreak In Jamaica." Times [London, England] 2 Apr. 1866: 10. The Times Digital Archive. Web. 7 June 2012. ^ In 1818 The Times reported the passing of an act by the House of Assembly in Barbados against the practice of Obeah, which carried the penalty of death or transportation for those convicted. "Colonial Intelligence." Times [London, England] 5 Dec. 1818: 2. The Times Digital Archive. Web. 7 June 2012. ^ Described as a 'curly-headed Creole', possibly intended to be mixed-race. F. Marryat, Poor Jack, Chapter XLI.